Commemorate the final Beatles album to be recorded, Abbey Road. This chic sterling silver necklace is made with a two-piece pendant featuring the silhouette of the Abbey Road cover cutout over a pavé set black CZs disc. This necklace can be worn at 17" or 19" to best suit your style. 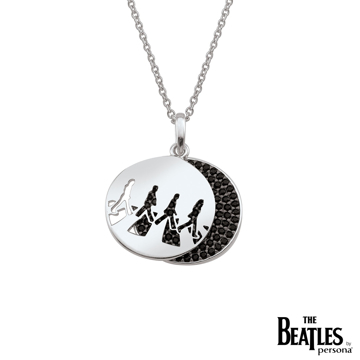 Beatles by Persona necklace features a sterling silver medallion with a cut out of Apple Records. The medallion is also engraved with the DropT Beatles logo, and filled with black enamel for a rock and roll feel. This necklace can be worn at 17" or 19" to best suit your style. This shimmering sterling silver necklace features the most recognizable icon of The Beatles. The drum is encrusted with pavé set CZs with an embossed logo of The Beatles in silver. This necklace can be worn at 17" or 19" to best suit your style. 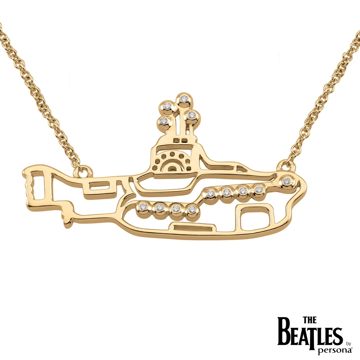 Cute and cheerful like the song, this Beatles by Persona 18K yellow gold over sterling silver necklace features hand set CZ stones and filigree details of the iconic Yellow Submarine. This necklace can be worn at 16" and 18" to best suit your style!.